The glycemic index of pear is estimated to be around 37 which classifies this sweet and soft yet moderately coarse fruit under low glycemic index category. Packed with loads of antioxidant and relative amount of dietary fiber, this fat free fruit is totally safe to be consumed without any guilt. The glycemic load of pear is 5.6 which puts it under low Glycemic load fruit. Is Pear Safe for Diabetics? Pear is safe for diabetics because of its low glycemic index which ultimately won’t raise your blood glucose levels rapidly and its high fiber content will help in slow absorption leading to gradual release of energy. Is Pear Suitable for Weight Loss? 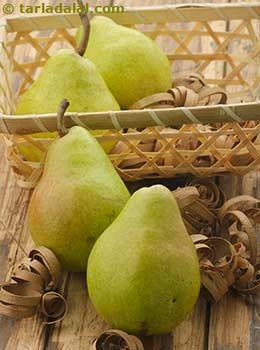 Pears are high in fiber which helps to keep you feel full for a longer period of time. Hence helps in weight loss. It is also very low in calories providing around 70 calories on consuming one medium sized pear (Approx. 130 grams). Glycemic index refers to ability of the carbohydrate to increase the blood sugar levels. The foods which increase your blood glucose levels rapidly are considered towards the higher end of the GI index while the one which increases the blood glucose levels gradually are considered towards the lower end of the GI scale.